What are you desperately seeking? Rosanna was Desperately Seeking Susan. Phil and Esteban? 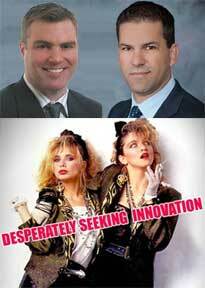 If you know them like we do, you know they're Desperately Seeking Innovation. The session, being made available to all HfS Research and SSON members this time only, will be based on the recent HfS Research study, Desperately Seeking Innovation in Business Process Outsourcing: Enterprises Speak Out. The report discovered most buyers of BPO services alike trimming 30% of their costs on one process--at the start--then 50% on another. But once those costs disappear from the balance sheet, they are quickly seeking new initiatives to attain new thresholds of productivity or revenue growth: what we terms “innovation.” In the call, we'll share the views of the nearly 600 shared services and outsourcing executives who we surveyed as part of the report. This call is part of a series of of Group Member calls we'll be hosting specifically designed for SSON premium members. We'll explore the experiences and expectations of today’s enterprise buyers when it comes to achieving innovation and we'll offer actionable recommendations for devising a strategy to improve your innovation agenda.